FreshBooks is an excellent Software as a Service for Online Invoicing for commercial blog owners, small business owners for one time or recurrent billing. We discovered FreshBooks from Rackspace Cloud’s Managed Hosting’s Client Control Panel. Rackspace, usually uses or suggests the best available option, but it turned to be more than what we could expect from an Online Invoicing Software. Payment Gateways are the best solution for transaction of Money. Paypal is basically a shortcut. Paypal merchant account does have quite good set of features, but it is actually not a Service for Online Invoicing. People uses fee online Billing Softwares to create pdf online. Those who can afford, uses Adobe Acrobat. We explained Software as a Service before, FreshBooks is a good example of such tool. And interestingly, this look has been created by just simple uploading of our logo, FreshBooks itself has configured the color of the tabs. You can edit the color overriding the auto settings, change the Tabs etc. FreshBooks solves a big problem – getting an account of Authorize.net. 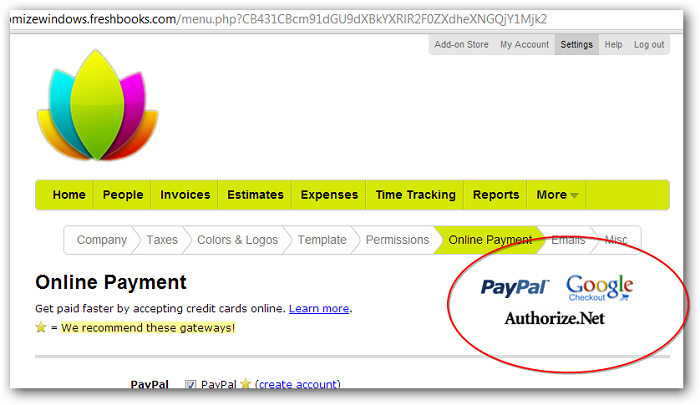 Authorize.net is used by Rackspace, deviantArt, Google for payment via Debit and Credit Cards all over the world. PayPal is oneway in India as rightly, Reserve Bank of India made the payment from India banned, because of its various issues to save from getting ripped. The problem becomes bigger when an Indian resident with Master Card Secure code enabled Debit or Credit Card needs to pay ! Paypal will be rejected by the gateway for security reasons. So the solution is to setup Authorize.net payment Gateway to receive money from the clients from India. But, getting an Authorize.net account is quite tough as they vigorous check the validity. It is difficult and painful. We do not know about the others but, for combined profile of having a Rackspace Cloud account (they accepts only payment through Mastercard, Visa,etc.). When we are applying through FreshBooks via Rackspace, the profile is becoming actually already checked. For example, we pay quite good amount per month through an account linked Master Card Secure Code enabled Debit Card. Rackspace manually phones to check for opening an account. As these are the facts which points – I as a human exist with the data provided is real, it becomes easy to get an Authorize.net account. Plus, the cost and pain of setup of SSL enabled webpage on our domain is bypassed. The practical example why we are worshiping FreshBooks will become clear if you think you are from U.S. and you need to pay me $300 through Paypal. I have no problem, I will lick your money. But if you wrongly pay twice or there is need to return your money, the only practical way is to issue a Banker’s cheque and send via DHL / Bluedart. This is basically why Google AdSense has only one way to pay us – Cheque. Using Authorize.net has the advantage that, in case of refund, only few clicks will be needed and the Banks, Mastercard gateway will return it to your account. Authorize.net through FreshBooks needs some verification, that is easier if you have proper papers and a small setup fee is needed ($100), but the hassles are eliminated quite easily. Freshbooks itself is not free for >3 accounts, but is free for billing 3 peoples / clients. That is handy for a freelancer, practically needs nothing to pay if the number of clients is < 3 and uses only Paypal to receive payments. There are other addons, some are free and some paid. Other is they have first class business mail by the United States Postal Service with a return envelope, two are free, rest buy if you need more. Just like big companies you can send a printed invoice through them. This Article Has Been Shared 6534 Times! Cite this article as: Abhishek Ghosh, "FreshBooks : Excellent Software as a Service for Online Invoicing," in The Customize Windows, September 30, 2012, April 21, 2019, https://thecustomizewindows.com/2012/09/freshbooks-excellent-software-as-a-service-for-online-invoicing/.